With the rise in popularity of low cost 3D printers for use in homes and small business many new printer designs have recently arrived in the market. The cost of ownership for 3D printers is coming down which is driving up access in new markets. With a customer base growing outside of engineers and tinkerers it is important that 3D printers must remain near 100% reliable with near zero failed prints due to mechanical and electro-mechanical malfunctions. We have found reliability of the filament feed gear is dependent upon three factors 1) amount of contact surface are between the drive gear and the filament, 2) depth of the gear’s tooth engagement into the filament 3) number of teeth engaged in the filament at any one time and 4) the direction of the force vector imparted from the filament drive gear into the filament. R&D at re:3D delved into this problem and below is result of their work. Figures 1 and 2 below shows a 3D rendering of the filament drive gear “Jaws” that will be mounted to the shaft of a geared NEMA 17 stepper motor. 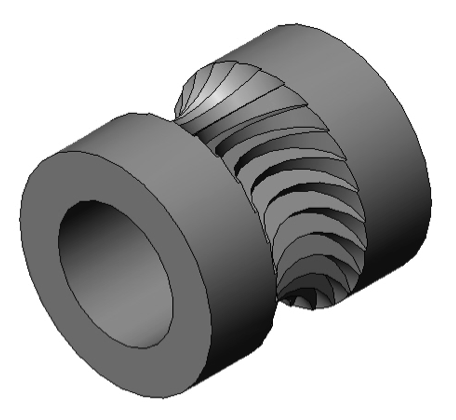 The Jaws filament drive gear is machined using a four axis Bridgeport CNC milling machine. In the design process our aim was to optimize the four variables stated above. 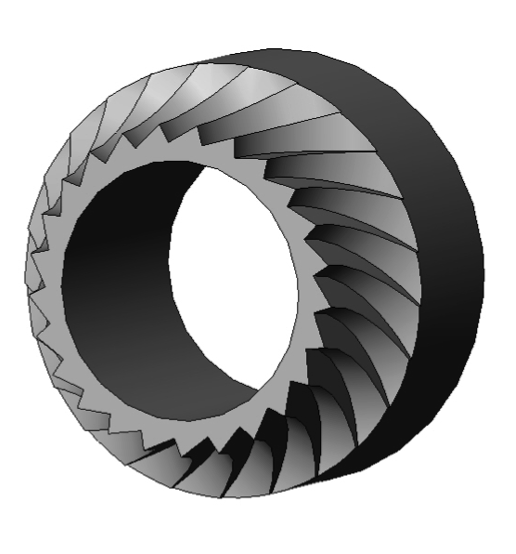 The amount of contact between the drive gear and the filament is maximized by machining the gear teeth using a cutting tool of the same diameter as the filament it will drive. In our case the filament is 6.0mm in diameter. The depth of tooth engagement was optimized by balancing greater tooth engagement with number of teeth engaged into the filament at any one time. If the tooth engagement is too shallow there will be too little surface area and force imparted to the filament and the teeth will slip and shred the filament. If the tooth engagement is too great the risk of plastic deformation causing the filament dimension to be out of spec for the hot-end and will cause jamming of the hot-end during printing. The number of teeth engaged into the filament at any one time is important in maintaining a smooth and constant push of filament into the hot-end. Consider the job of the filament drive gear is to transform the rotational motion from the stepper motor into straight line movement of filament into the hot-end. If too few gear teeth are engaged into the filament the linear motion of the filament over time will assume more of a sine wave pattern than a constant straight line movement. The force vectors should be directed in the downward direction as much as possible to increase the conservation of energy in the system. Any forces imparted into the filament in the lateral direction will cause plastic deformation of the filament and not translated into pure downward force of the filament feed. It should be noted there will always be a certain amount of lateral force experienced for the pure fact that the drive teeth will need to be engaged into the filament. 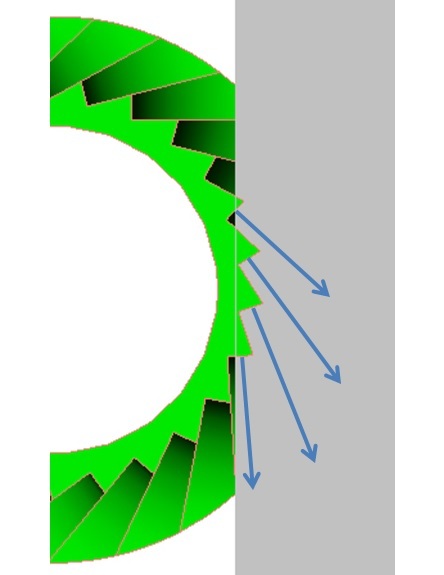 By studying the section view in Figure 3 below you can see the depth of engagement, the number of teeth engaged and the force vector for a 25 tooth drive gear. Stay tuned for part two in this series where we will perform data collection and force measurement in a real world application of the Jaws filament drive gear.